"Changing Your Putter - Absolutely, 100% the fastest way to lower your scores"
Have you ever felt totally let down by your putter? Imagine this... you've just walked off the 18th green having three whacked the last three greens for a miserable score - you've lost interest, lost money to your friends and lost all golfing self-respect! And this is supposed to be FUN! But... you've just sunk a sliding 10 footer to shoot your lowest ever score, win a club tournament and make back the wager you lost to your buddies the week before. ... all because you bought a new Scotty Cameron (or Ping or Odyssey) mid-week and you've been dying to try it ever since. Best of all it was a complete bargain and matches your stroke perfectly. Now you can really start to enjoy the game! Want to become an awesome putter? Well, who doesn't? I might as well have asked you whether you wanted to be better looking or richer. I can't help you much with looks or money, but I probably can help you hole more putts. I'm an avid former professional golfer who's been trying desperately to sink a few more putts each round for the last 25 years, and I've found out quite a lot along the way...! Now everything I've found out about putters and putting is on this website: www.Best-Putter.com. Enjoy! There are several things you MUST know before choosing a putter - get them wrong and you'll never make as many putts as you should. Get them right and you'll be one very happy golfer! Is your putter length really that important? Well... take a look at the picture here. Two PGA Tour winners but with very different sizes of putter. Collectible Putters - What's my putter worth? How can you tell if I own any collectible putters? Here are a list of resources which will help you tell whether you've got a gem in your bag! What is Tiger Woods putter? is one of the questions we most often get asked at Best-Putter.com. What is Tiger Woods Scotty Cameron? - Not as simple a question as it might seem. The straight answer is that Tiger uses a Scotty Cameron prototype putter which is closest in shape to the Newport 2 design. Rory McIlroys putter was the the source of much discussion in the golfing world. He followed Tiger Woods from using a Scotty Cameron Studio Select Newport GSS prototype to a Nike Method putter. His putting is one of his great strengths, and after an initial teething period, he seemed to putt just as well with the Nike as he did before. Almost all putter clones available today are products of the Far East: Namely China, Vietnam and Thailand. Find out how to spot a fake a mile away! Odyssey Putter Clones - how to spot them? Looking for a college logo putter? They're gaining in popularity, and yet are still individual enough to express yourself with. If you want to have your college crest emblazoned on your flat-stick, you could go for an off-the-shelf logoed putter or get creative and have your current blade customized. 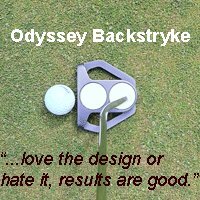 Looking for an Odyssey Putter...? Find out by reading genuine, hands-on reviews! Want an Odyssey putter? They come in all shapes and sizes, but what do they feel like to use and how do they roll the ball? Our hands-on reviews will tell you! You can also find out where to buy them at the best prices! Looking for a Ping Putter? Find out which models are the best by reading genuine, hands-on reviews! Searching for a Ping putter? They're some of the best and most recognisable putters of all time, but which models are the best? Our Hands-on, independent reviews will let you know! Looking for a Yes Putter? Find out which models are the best by reading genuine, hands-on reviews! Searching for a Yes putter? They come in all shapes and sizes, they all have the C-Groove, but what do they feel like to use and how do they roll the ball? Our hands-on reviews will tell you! You can also find out where to buy them at the best prices! Find a Nike Putter at the best price! Also find out which model is best with unbiased, hands-on reviews! Searching for a Nike putter? Find out what new and old models feel like to use and how they roll the ball? Our hands-on reviews will tell you everything you need to know! You can also find out where to buy them at the best prices! 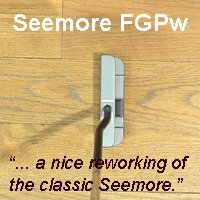 Looking for a Seemore Putter...? Find out which is the best model by reading genuine, hands-on reviews! ... but what do you mean by a Titleist Putter? Do you mean a Scotty Cameron Titleist or a Bullseye? Once you've decided that you probably want to know what they feel like to use and how do they roll the ball? Our hands-on reviews will tell you! You can also find out where to buy them at the best prices! While the STX putter may not be a household name like Odyssey or TaylorMade, they have been around since the 1970s. Searching for a Cleveland putter? They come in all shapes and sizes, but what do they feel like to use and how do they roll the ball? Our hands-on reviews will tell you! You can also find out where to buy them at the best prices! Looking for a Wilson Putter...? Find out if they're any good by reading genuine, hands-on reviews! Searching for a Wilson putter? What do they feel like to use and how do they roll the ball? Our hands-on reviews will tell you! You can also find out where to buy them at the best prices! The best Never Compromise Putter ... which model is it? Find out by reading genuine, hands-on reviews! Searching for a Never Compromise putter? Sure, but what do they feel like to use and how do they roll the ball? Our hands-on reviews will tell you! You can also find out where to buy them at the best prices! A Kirk Currie putter is virtually a thing of legend nowadays. Kirk is a putter designer with over 20 years of experience creating designs for major manufacturers and touring professionals. Tour Edge Putters seem to be pretty new to the market, but in fact they&#8217;ve been around a little longer than you might think. 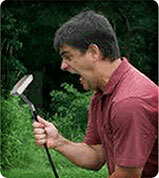 The company was formed in 1985 and their putters are generally in the more affordable category. 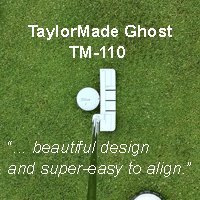 The Best Face Balanced Putter - Find out which models are the best by reading genuine hands-on reviews! Which is the best face balanced putter? www.Best-Putter.com's independent, hands-on reviews tell you! Also find out where to buy them at the best prices! 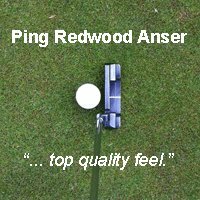 Anser Style Putters - Find out which models are the best! Which are the best Anser style putters? www.Best-Putter.com's independent, hands-on reviews tell you! Also find out where to buy them at the best prices! Futuristic Putters - Find out which of these high-tech models are the best by reading genuine, hands-on reviews! Which are the ultimate futuristic putters? Let www.Best-Putter.com's independent, hands-on reviews tell you! Also find out where to buy them at the best prices! Insert Putters - Which are the best? Blade Putters - their feel is unbeatable, their touch unmistakable - Find out which models are the best by reading genuine, hands-on reviews! Which are the ultimate blade putters? 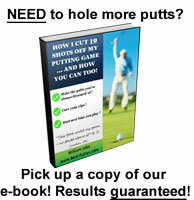 Let www.Best-Putter.com's independent, hands-on reviews tell you! Also find out where to buy them at the best prices! Which are THE classic putters? This is our list at www.Best-Putter.com. Read an independent, hands-on review of each and find out where to buy them at the best prices! Offset putters are those where the top edge of the putter is behind (i.e. further away from the target than) the leading edge of the shaft. Most people putt better with an offset putter because it encourages the hands to lead the head through the stroke and when this happens, off-center hits twist the face less. Click on the links below for independent reviews of all sorts of offset designs. Onset Putters - What are they good for? Onset putters are a little hard to come by, but can make a big difference to your putting. Click on any of the links below for an unbiased review of onset putters and to find out where you can buy them at the best price. Mallet Putters - Find out which are the best by reading genuine, hands-on reviews! Mallet putters come in all shapes and sizes, but what do they feel like to use and how do they roll the ball? Our hands-on reviews will tell you! You can also find out where to buy them at the best prices! Belly Putters - Find out which models are the best! Which are the best belly putters? www.Best-Putter.com's independent, hands-on reviews tell you! Also find out where to buy them at the best prices! Ben Crenshaw was almost certainly the most naturally gifted putter in golf. For several decades he reigned supreme on the greens with a putter his Dad bought him as a kid for $20. Was he the greatest? Possibly. What can you learn from his putting? Without doubt, Luke Donald ranks highly among the greatest putters of all time, not to mention his short game. The former world number one owes a great deal of his success to his performance on the greens, producing scintillating statistics year after year out on tour. Brad Faxon holds many putting records on the PGA Tour. Was he the best ever to hold a flatstick? Possibly. What can you learn from his putting? Statistically speaking, Aaron Baddeley ranks as one of the greatest putters in modern day golf. Between the start of his US PGA Tour career, in 2007 and 2013 he has only once ranked outside the top 15 putters on the annual stats for putting and has usually been inside the top 10. Only Luke Donald and Tiger Woods come close to this consistently high level of putting. But even they don't out putt Baddeley on the stats. Bobby Locke is regarded among the connoisseurs of the game as perhaps the greatest putter of all time. Gary Player has always maintained that Locke's talent and confidence in his putting method were the greatest. There are also arguments that suggest he would have been even better had it not been for his unfortunate railroad accident in 1960. Nick Faldo - was he the best putter in the history of golf? Nick Faldo was a great pressure putter. Whether it was at the British Open, Masters or Ryder Cup, during the late 1980s and 1990s nobody holed more putts when it mattered. Was he the best putter of all time? Plus, what can you learn from his technique? Brandt Snedeker has made his name as a truly great putter in a very short period on the PGA Tour, when he started the 2013 season with three wins in four starts. His win at The AT & T International Pro-Am at Pebble Beach took him to number four in the world rankings, and putting played a huge part of his ascension to the top of world golf. Webb Simpson goes very quietly about his work on the greens, but slowly, and surely he has become regarded as one of the great putters of his generation. Controversially he used was the second player in the history of the game to win a major championship using a belly putter. Ernie Els is by and large, regarded as a great putter, despite the inevitable peaks-and-troughs relationship with his putter. As an international player, he has had to deal with all grasses around the world, and has, quite frankly, mastered all of them. So in a way, Els has followed in the footsteps of compatriots Locke and Player, thus continuing South Africa's run of great putters. Need help choosing a putter? The Best-Putter team gives free advice!